I went to go see the Oscar nominated movie The Reader this weekend (very good by the way), and it's filled with "hot bath" scenes. Inspired, I'm taking the timeless wellness treat of a "hot bath" to the next level. Without the SPA cost. 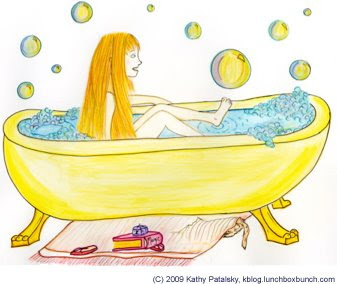 Here is my list of five "deliciously" skin-nourishing bubble bath recipes, using ingredients from your kitchen cabinet. Top Five Skin-Nourishing Bubble Bath Recipes....from your kitchen. Ingredients: 1/4 cup olive oil and 4 Tbsp. sea salt (the thicker, the better). PREP: Combine sea salt and oil. Scrub on your skin before getting into bath. Let oils naturally dissolve into hot bath water. WHY: Sea salt is purifying and draws out toxins from the skin. Olive oil is very softening and aides in hydrating to the skin. PREP: Drop 4-6 tea bags into your hot bath water. Allow them to steep for five minutes for optimal "tea water" bath. Any tea bags can be used: green, black, herb or even chai! WHY: Tea contains a plethora of antioxidants which help to nourish your skin. Herb teas such as chamomile, may also provide a softening, calming effect on your skin. Ingredients: 1 lemon, 1 orange or grapefruit. 1/4 cup olive oil. Handful of salt. PREP: Squeeze lemon and grapefruit. Strain out as much pulp as you can. Mix with olive oil and salt. Do not throw away the "juiced" fruit! Add juice/oil blend and leftover whole "juiced" fruit to hot bath. WHY: The citrus fruit acid will detoxify your skin and the high Vitamin C content will treat your skin as a free radical fighter. The olive oil will soften the intensity of the fruit acids from the citrus fruit. The salt aides in skin purification. The rind of the leftover fruit simply adds to the lovely citrus smell to the hot bath water. Ingredients: 1/4 cup honey, 1/4 cup table sugar, 1/4 cup olive oil, 1 cup milk or soy milk. PREP: Combine oil, sugar and honey. Apply mixture to skin as a scrub. Pour milk into hot bath water. Soak in hot tub and allow mixture to dissolve in water. WHY: A sugar scrub is great for exfoliation. Honey will soften skin and olive oil will nourish. Milk has been known to nourish, calm and soften skin. Ingredients: Day Old wine. (Red preferred), Day Old Rose Petals. PREP: Simply add wine and petals to hot bath and soak!